A report by Torrent Freak reveals that Microsoft has been mistakenly issuing DMCA take down notices to Google for sites like CNN, Buzzfeed, BBC, and Huffington Post. 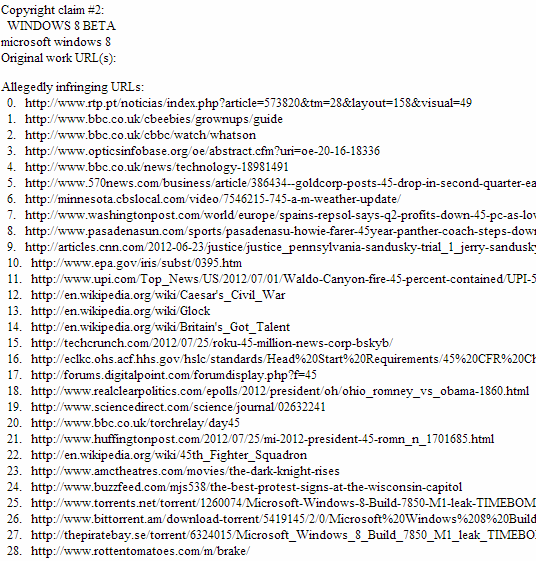 The requests were made regarding copyright infringement claims for the terms “Windows 8 Beta” and Microsoft Windows 8,” but the URLs in question refer to a Huffington Post article about the presidential election, a Washington Post article about the Spanish oil company Repsol, a Wikipedia entry for Britain’s Got Talent, among other unlikely pages. You’ll notice that none of the links are all that relevant to Microsoft’s business, and the majority come from corporately-owned or otherwise respectable companies that would be unlikely to engage in copyright infringement against Microsoft. While the majority of the listed content appears to have been cited in error, there are a handful of URLs that have been correctly requested, including links to files related to Windows 8 found on The Pirate Bay, Torrent.net, and Bittorrent. According to Torrent Freak, of the 65 URLs that are claimed, less than half were obvious mistakes. The problem stems from automated algorithms that rights holders use to find and issue DMCA takedown notices. With the sheer volume of URLs that companies like Microsoft’s rightsholders must search for, the process is far from foolproof. Since the Digital Millenium Copyright Act of 1998 was introduced, a study by researchers Laura Quilter and Jennifer Urban, from the University of Southern California in 2005 found that over half (57 percent) of takedown requests that Google receives targeting “apparent competitors.” 37 percent of notices to Google target sites outside of the United States and invalid copyright claims. Google began publishing the details of copyright complaints in its Transparency Report, where you can take a look at the rights holder organizations that are representing Microsoft and the volume of complaints that Microsoft has filed. In the month of September alone, 539,951 takedown requests were sent to Google among five different organizations representing the company. The median number of requests that Microsoft makes per week for removal is as many as 80,000. The total number of requests so far since September of last year is approximately 4.8 million URLs. The 65 URLs requested to be taken down in this particular instance are merely requests, and Torrent Freak has found that Google has not yet complied with all of them. Edit: We heard back from Microsoft and the company’s statement has been reflected in the article.